Combination boilers, also called combi boilers, offer a space-saving solution for homes that incorporate boiler-based heating systems. A combi boiler is a compact tankless appliance that handles both home heating and water heating for higher energy efficiency and space efficiency, replacing the separate—and large—boilers and tank water heaters used in the past. Today, combi boilers are quickly growing in popularity for several reasons; keep reading for a closer look at the Navien brand of condensing combination boilers and their benefits. Maintaining a separate boiler and water heating system is costly in many ways, from the cost of maintaining and repairing these systems separately to the costs of producing heat and hot water for your home. Additionally, both traditional boilers and storage tank water systems take up space, reducing the amount of available square footage for other purposes in your home. Navien combi boilers eliminate the need for a separate boiler and water heating system, replacing both of these large units with a single compact system capable of delivering hydronic heating and hot water for all of your daily needs. These systems occupy up to 80% less space than your previous appliances and use cutting-edge heating technology to reduce wasted heat for more efficient home and hot water heating. Navien systems can use your existing 1/2” gas piping and require low gas pressure for easy retrofitting and conversion from natural to LP gas, reducing installation costs and time as well. Navien is considered one of the industry leaders in condensing tankless water heating technology, as well as a worldwide leader in green technology. This Korea-based company specializes in residential boilers and water heaters, developing high-quality products with features that have both convenience and energy savings in mind. Not only are Navien combi boilers effective, but they are also easy to use, featuring clear instructions and a simple control panel. Navien products are highly desirable and often recommended because of their consistent performance, longevity, low maintenance requirements, and unique features that provide sophisticated control and maximum energy savings without sacrificing comfort. These combination boilers qualify for the ENERGY STAR label in terms of both home heating and water heating; Navien also offers a 10-year warranty on each unit’s long-lasting and corrosion-resistant dual stainless steel heat exchangers, which outperform aluminum and copper heat exchangers in terms of longevity and reliability. 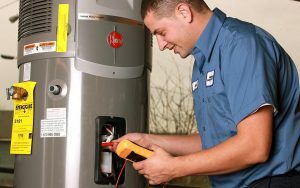 If you are considering upgrading your boiler or water heater, our experienced technicians can help you evaluate your options and determine if a Navien combi boiler is right for your home. Contact us today and we’ll get your appointment scheduled as soon as possible.